This month’s featured truck is a beautiful 1977 Mack RS700L owned by Trent Blasco of Buffalo Grove, Illinois. 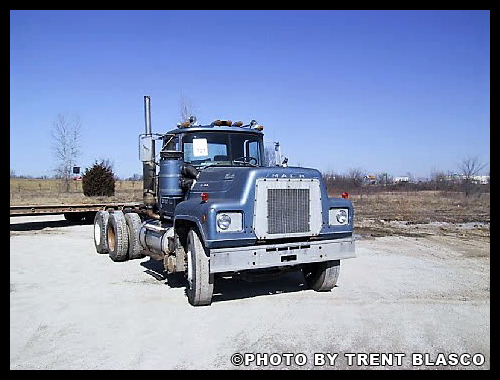 Trent purchased the truck in January of 2005 and is its fourth owner; the tractor had previously been used by a construction company in Kansas City and before that by owner operators who hauled freight and produce throughout the Midwest. 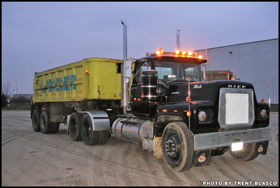 The RS700L, when purchased new from Wichita (Kansas) Mack, was equipped with a 36 inch Able Body sleeper which was removed before Blasco’s acquisition. 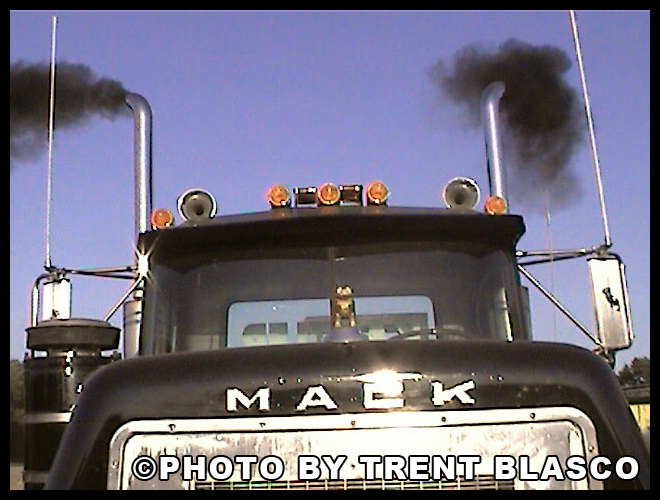 Powered by a Mack ENDT 676, 285 bhp Maxidyne mated to a Mack Maxitorque triple countershaft 2 stick 6 speed, it rides on Mack 34K Camelback springs with Mack 4.17 rear ends. The tractor retains its 206 inch factory wheelbase. 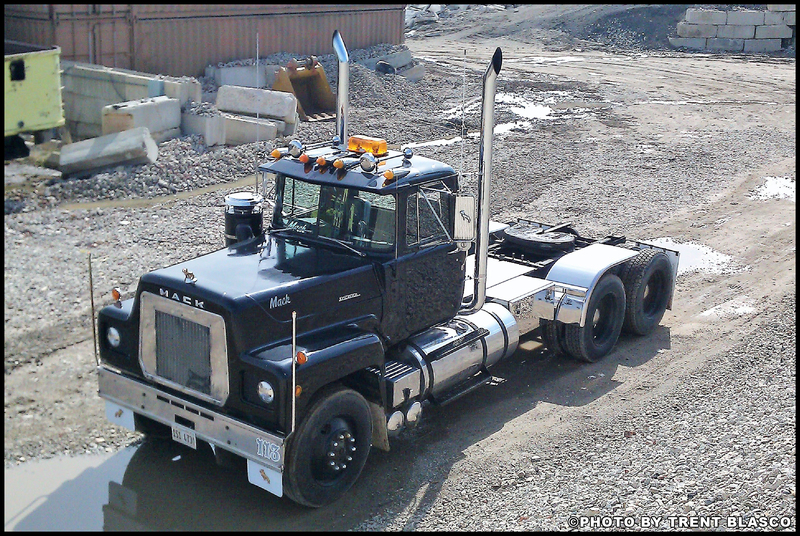 Trent redid the cab with Mack’s “Western” button tuck interior while repainting the exterior in the spring of 2005. Everything was finished in black. To reduce noise, in 2008, Trent installed a new roof skin and added sound reducing insulation throughout the entire cab. He also added new dash panels with full factory gauges and converted to a dual exhaust system. Trent fabricated new stack brackets to improve on holding the stacks to the cab sides. 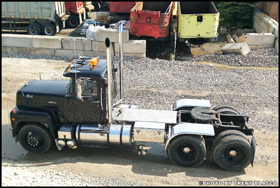 A Superliner II cab air ride system was installed in place of the original solid rear cab mount. There’s an AM/FM/CD/Satellite radio in the newer overhead console and a standard Cobra CB radio mounted in the dash. 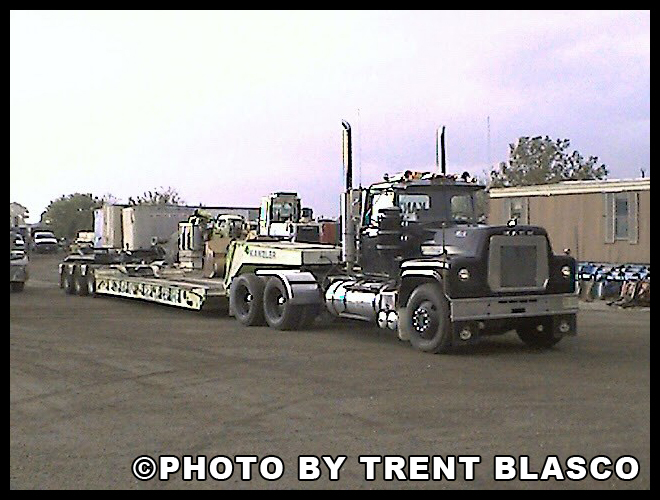 Trent installed a Mack PTO and a 2 line wet kit to pull end dump and lowboy trailers. When Trent bought the truck he worked in and around Chicagoland and took it to many truck shows in Iowa, Wisconsin and Indiana. 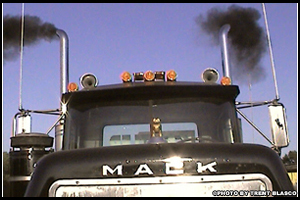 Now retired from commercial work, the tractor is used for attending truck shows. 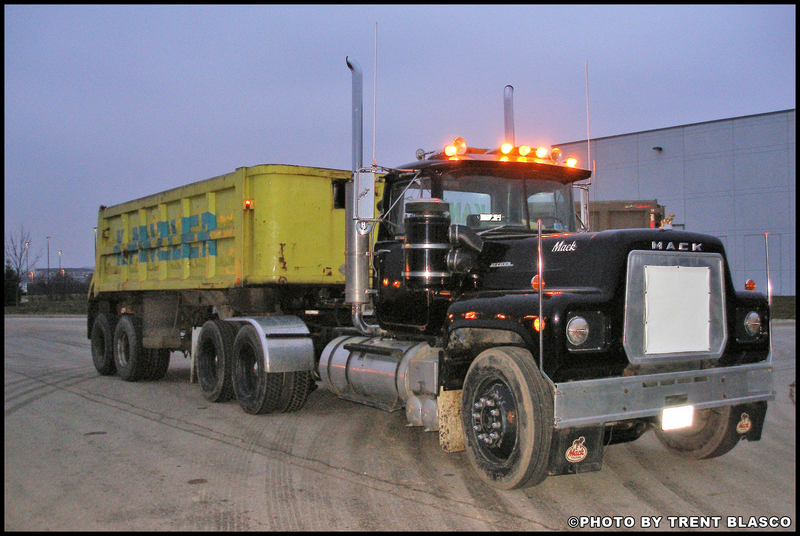 Plated as an antique, Blasco does use the Mack occasionally to move trailers for private use. 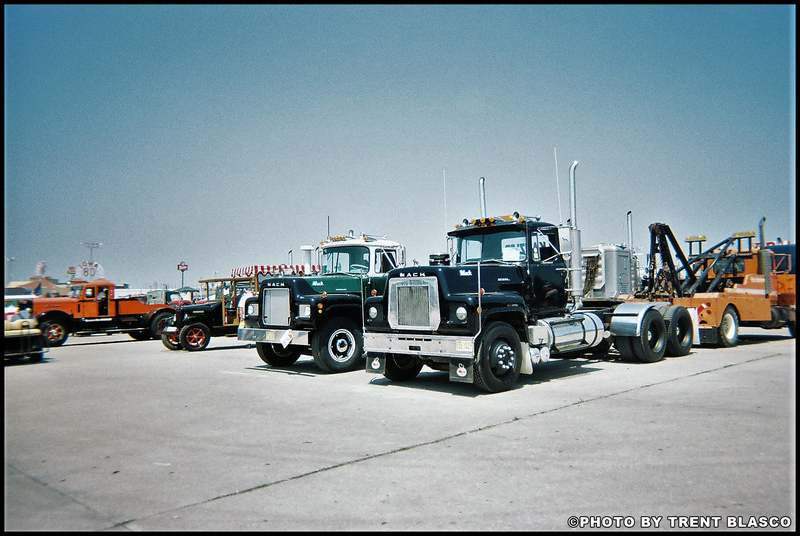 Trent states that Western-built Macks were designed to have a low tare weight, therefore they used many aluminum components, unlike their Pennsylvania-built models. Trent’s RS700L was delivered at 15,500 pounds, equipped with aluminum radiator mounts, cab brackets, spring hangers, air tanks, fuel tanks, wheels and rear end chunks. 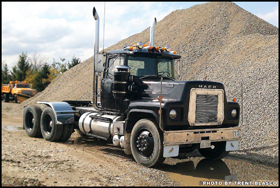 In addition to his R model, Trent owns two 1965 Mack B models- a B-61 and a B-75, that he plans on restoring sometime. In the summer he cruises around in a ’65 Cadillac and during the winter he builds 1/25 scale model trucks and collects HO scale trains. 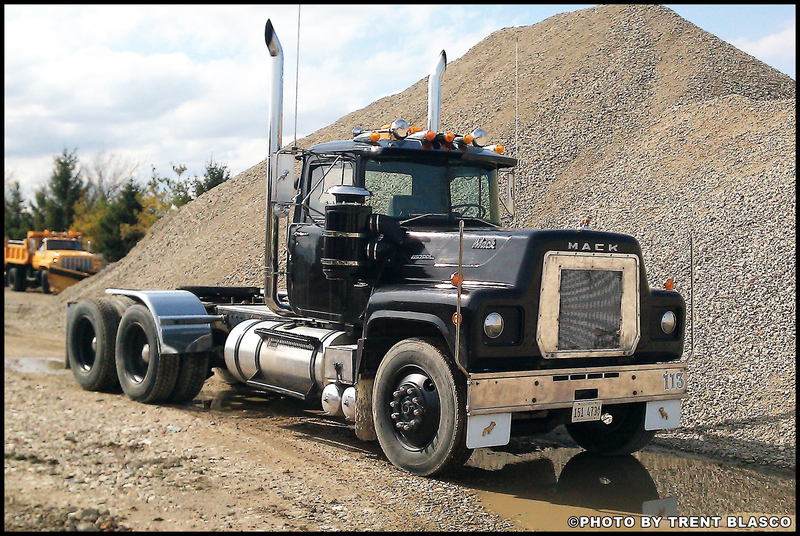 Special thanks to Trent for sharing his beautiful Mack Western RS700L with us! Do you own a unique rig? Get your truck featured here on our website and show-it-off to the world! Click Here to contact us and tell us about your truck!